No surprise here: the Amish continue to grow at a gallop.With a population that doubles roughly every 20 years, the Plain sectarians are on pace to cross the 300,000-person threshold within the next year or two. As of 2014, the Amish have set up shop in 30 states (plus Ontario), from traditional strongholds such as Pennsylvania and Indiana to more recent communities in Colorado, Maine, and Tennessee. Three states have long been home to large numbers of Amish. Pennsylvania is most closely-associated with the Amish, home to their oldest communities as well as their best-known (Lancaster County). Ohio, similar in size to Pennsylvania with over 65,000 Amish people, lays claim to two of the top four largest settlements–Holmes County and Geauga County. 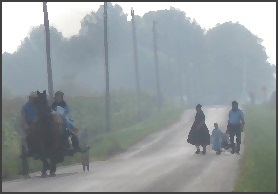 Indiana is covered with Amish communities from top to bottom, from the large northern settlements of Nappanee and Elkhart/Lagrange County, to the sizeable Daviess County settlement in the south. Together, these three states account for nearly two-thirds of the total 2014 Amish population of 290,090. Amish have found a number of other states attractive, as they’ve faced pressures in traditional locales including high land prices and overcrowded communities. Wisconsin hosts the fourth-largest Amish population, spread over nearly four dozen communities. Amish have flocked to New York in droves in recent years, with ten new settlements appearing in just the past three years. States such as Kentucky, Michigan, and Missouri have also long had robust Amish populations and have seen new communities arise recently. Amish have also set out to found communities in less traditional areas of the country. States such as Colorado, Maine, Texas, Montana, and Tennessee have seen Amish relocate within their borders. Additionally, a number of states have long-standing Amish presence, though they don’t attract much new settlement. These include North Carolina, Delaware, and Florida. While some Amish communities are home to thousands of people, Amish preserve a close-knit society by intentionally keeping their church communities small. Church districts, typically of 25-35 families, are geographically-based areas comprising neighbors who worship together on a bi-weekly basis. Amish religious service differs in a key way from most other Christian churches: Amish do not build church buildings, instead opting to hold church in the home. When church districts exceed a certain number of families, Amish will prepare to divide the church. New church boundaries will be drawn up, and new ministers will be ordained for the new congregation. How large will the Amish population grow? A number of factors could alter the current rate of growth, and may even lead to population losses as Amish move to other churches or leave the faith. At various times throughout their history, religious movements have attracted significant numbers of Amish to different churches. Scattered Amish continue to leave their faith for other churches, though in relatively small numbers. The attraction of taboo technology is another factor drawing some Amish away. 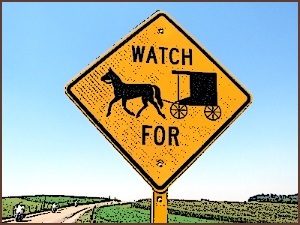 While the idea that the Amish are “frozen in time” with regards to technology is false–Amish do adopt, and adapt, new technologies over time (solar panels, and propane-powered refrigerators are just two examples)–some devices, such as the car, remain off-limits. A difficulty in making a living via traditional agriculture may make remaining Amish challenging for some. However, despite only having an eighth-grade formal education, many Amish have found success in alternative occupations. Business ownership has been a key area of growth for the Amish, who have had success in fields including construction, furniture-making, craft work, and manufacturing. Amish also work in non-Amish industries–a good example of this is the RV industry of northern Indiana, which employs thousands of Amish men in the dozens of recreational vehicle factories throughout the region. The Amish birth rate may also decline. Though Amish typically have from 6-8 children, the number can vary greatly across different communities (Amish of different affiliations vary in how progressive or conservative they are regarding technology and other aspects of life). Researchers have discovered that Amish women may average as few as 5.5 children in some communities and over 10 in others (see The Amish, Kraybill, Johnson-Weiner, Nolt, p. 157). 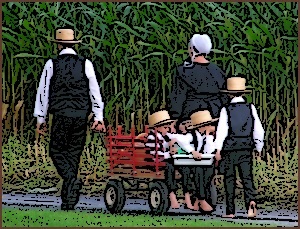 As some Amish become more progressive in their outlook and receptiveness to birth control–otherwise taboo in the community–family size may decline. One million Amish by 2050? At current growth rates, Amish should cross the one-million population mark by the year 2050. The horse-and-buggy, plain clothing, PA Dutch language, home worship, and limited technology are core elements to Amish identity. Amish strive to preserve these while slowly adapting around the edges as financial and societal pressures dictate. As general society changes and the Amish evolve while striving to preserve tradition, the Amish of 2050 will likely look different than their counterparts of today–though it’s hard to say by how much. The total number of Amish in the US is approximately equal to the number of annual attendees at the Elkhart County 4H Fair. Well, I suppose it’s not ENTIRELY unrelated; a fair number of the fair attendees are Amish. But it’s not exactly a causal correlation. They especially like to come on the second Friday night for the draft horse pull (in which a few compete every year) and the rodeo (in which, to my knowledge, none of them compete). It wouldn’t surprise me to see a few at harness racing today and tomorrow. One of the long-time harness racers, Harley Yoder, “grew up Amish.” I wouldn’t be surprised if there were a few other harness racers originally from Amish families, too. Well, gotta go. See you at the fair! Thanks for your good wishes, Erik! For several years, I have taken my “stay-cation” the week of the fair. I buy advance tickets and go for at least a while every day. Even with the inflated cost of food, it’s a lot cheaper than going to a hotel for a week, and there aren’t many tourist attractions you can enter for six bucks (advance price) these days. I thought of your blog when an entire group of about 20 Amish sat behind me at the harness races today. Nice! I hope the races were worth their and your while. Sounds like a good show at a good price. Wish a whole community of them would make their way to South Carolina! For whatever reason South Carolina has not been much on the Amish radar, I’m not sure if there has ever been a community there. There are some Mennonites in SC though. There seems to be a claim down here that Amish do live in South Carolina, in the Abbeville area. I can’t say that I’ve verified it, but if you search for “Amish in SC,” you’ll get something like this restaurant. My wife and I had lunch there about a year ago. It was pretty obvious that the cuisine and the servers were Amish-like. There actually aren’t any Old Order Amish in South Carolina, but Mennonites in the Abbeville area. I used to run into Amish people who had relatives there every now and again. There is a “Dutch Oven” restaurant too that is apparently Mennonite-run. It’s possible that Amish stay away from SC because the soil tends to be clay. Not the rich black soil one might want. Around Aiken, too. They sell fruit on the side of the road. Very pleasant people. Nice job on the infographic, Erik! I’ve seen others on other websites, and yours is a very good “1st try”! I like the font and “old-fashioned-looking ink” you used. Since I’m “into” graphic novels/comics and have the job of ordering graphic novels (for kids) for my library, including having had “Reading With Pictures” founder, Josh Elder do a program for us a few months back, I am well aware of how “graphics” can communicate as well (or better) than the written word. And not just for kids or Seniors, either! Some folks are just more “graphically-inclined” as far as learning goes. So, I’m looking forward to more of your infographics on Amish America—“a picture’s worth a thousand words”. Thanks for your hard work at constantly improving Amish America, Erik! It’s appreciated! Thanks Alice Mary, my pleasure. I hope to do some more of these on different Amish topics, a buggy one might work actually. Are there any Amish or Mennonite on Long Island? There are no Amish on Long Island JoAnn, I am sure there are some Mennonites in some form but I haven’t heard much of there being any plain Mennonites in that area. In New York you don’t reach Amish until you get upstate, Oneonta area and beyond. There are quite a few communities in Mohawk Valley, Finger Lakes region, and western NY. I didn’t know there were Amish near Oneonta. My grandparents live near there and we will be up there this next week (blueberry season!!!!). I would love to know where the nearest Amish community is located. You’ll see there are two listed that are at least partially in Otsego County where Oneonta is located. And looks like there are others in neighboring counties. The map at the bottom of the article will give you an idea of where Amish settlements are spread across the state. There are 50 settlements listed, including ten founded in just the past three years. The Empire State remains an attractive destination for Amish people. I like the graphics & I am not usually drawn to graphics. BTW: I now know that Alice Mary is two years older than me! Appreciate it, Oldkat. I am sort of the same way but this exercise has gotten me more interested in them. I wanted to start with a pretty straightforward design here since I’m not a designer. But there are some really creatively-done infographics out there that show the power of visualizing data. I just checked with my counterpart at National Grid Long Island (formerly Long Island Lighting Comany) about any Amish on Long Island. He got a pretty good laugh about that and told me that he was reasonably sure that there are none. Thanks for the infographic Erik! Love it! Great job!! Thanks, Dave! Glad you liked it. They seem to be doing their damnedest to avoid New Jersey. I blame the negative depictions of my state on shows like Jersey Shore for prejudicing the Amish. In all seriousness, there is more farmland in NJ than one would think. There is a conservative (Maranatha group) conmish Mennonite Church in Narvon, PA. We have friends at West Haven. This would be very plain but car driving Amish Mennonite. I think they have a farm market, and I don’t know what else. We originally came from NJ before moving to Lancaster County. The taxes are high in NJ, and it is quite liberal socially so that may be discouraging people. There is a small very conservative Mennonite (Eastern PA Menn) group a Vineland, NJ (also car driving) but otherwise very traditional. Would that be propane powered TV’s? Erik Do you have a list of all the plain communities (Amish and Mennonites) in the states of Kansas and Missouri? I hardly dealt that their are any Amish anywhere in NYC Proper. however, it does explain, that it was the Mennonites having a food market in NYC Central Park on 09-11-01.
yes, the Mennonites have food markets, even in NYC Central Park. Eric, would you have anymore Info on my point? More than 90% of people on a financial blog I participate in would be very happy to have Amish neighbors. They facilitate buying healthy fresh local produce, sheds, and furniture. My wife enjoys shopping at their market whenever she can. On a point relevant to current events: Note that despite their deeply held religiously motivated lifestyle choices, you don’t see them blowing up the electrical power grid, gas stations, or public schools. I’ve never been held hostage by them and been forced to quote passages out of the King James Version of the Bible in order to be released. The Amish really are the best neighbors one could be blessed with. Many years ago, about fourteen I think, five Amish men flew to Tasmania, a state of Australia, as they were considering re-settling their entire community to Tasmania. Up until then the only Amish I had known of was an Amish family that lived firstly in the Blue Mountains west of Sydney, and then in Nabiac, on the north coast of NSW. I bought some of their products from their business “The Amish Country Barn”. This business is now closed, and nobody knows where this family and their business have gone now – here in Australia, or returned to America. The reason I know about the Amish visiting Tasmania is that the Premier of Tasmania, Jim Bacon, who wanted to offer them business migration, asked me if I could find out where they had come from, (which community), and who they were so he could get in touch with them. In spite of being a religious studies / theology person with wide contacts I never could answer these questions. I agreed with him that, as they are very good farmers, they would probably enrich the rural economic well being of the state. I m interested in knowing much more about the Amish, and also why they chose not to relocate to Tasmania, Australia, though I do recognise this would be a very brave and hard decision. I don’t know if these are the people you are thinking of, but there is a new order Hutterite Colony in Detention River, Tasmania. They are plain people but use vehicles and electricity. Many of their members would have Amish ancestors. Your statistic missed some Amish in Georgia, USA. Not sure which county but I remember in 2009 I met some Amish in the south of Georgia who built small “portable” buildings. Mennonites in Montezuma Ga. they make portable buildings. There are several different Mennonites that make the buildings. There is or was an Amish Harness & Buggy sale 2 times a year in Perry, Ga. The Harness & Buggy sale still goes on twice a year but is now in Unadilla, Ga. This is about 14 miles south of Perry Ga. on Interstate 75. The sale is held in May and November. It has antiques, new and used tack, horses, mules, etc. and buggies for auction. There are a lot of Amish there but as far as I know it is not run by Amish anymore. Mennonites in Montezuma Ga. they make portable buildings. There are several different Mennonites that make the buildings. There is or was an Amish Harness & Buggy sale 2 times a year in Perry, Ga. The Harness & Buggy sale still goes on twice a year but is now in Unadilla, Ga. This is about 14 miles south of Perry Ga. on Interstate 75. The sale is held in May and November. It has antiques, new and used tack, horses, mules, etc. and buggies for auction. There are a lot of Amish there but as far as I know it is not run by Amish anymore. Check internet for Southern Georgia carriage and antique action dates. Why aren’t there any Amish in North Dakota? Does it have to do with laws about schooling? The agricultural resources? The sparse population? I was born in rural North Dakota and have relatives there. So I’m curious. Following up on Mr. Buck’s comment below, there were several attempts by Amish to settle North Dakota dating to the late 1800s. David Luthy’s Settlements That Failed book has more on these. I don’t have it in front of me to check the ND community specifics, but often problems related agriculture or finding a market for crops often played a role in those long-ago Amish settlement failures. I’m not aware of the schooling laws in ND, is there something that might prevent traditional Amish schools? Thanks for your replies, Mr. Buck and Erick. I had to look up some of the placenames in that GAMEO. Most are northeast of the places where my relatives and I lived. My grandfather and his parents and siblings came on an immigrant train to ND in 1902, later than the first Amish, but close to the time of one of the pulses of Amish immigration. My parents left in 1956, about the same time the last Amish settlement died out. I have vivid memories of the big move. When I was a kid school laws were much more lax in ND than in Iowa, where my wife is from. I’ve read elsewhere that those laws made it difficult for Amish in Iowa, and drove many of them out. In ND there was no compulsory kindergarten, and assignment of kids to grades was pretty much left up to local teachers. If there were laws about it they weren’t much observed. I attended one-room rural schools; most of those were gone in Iowa by then. The last school I attended there in fall 1956 was a public school, and it even had indoor plumbing. It had a stable where kids could put up the horses they rode to school, but I remember it being used only once for that purpose. ..positively become Amish member, for its philosophy and religious principles convice me, but being 64 I wonder if that would be possible for me, even though I am farmer and fond of sustainable agriculture, but nowadays muy capacities for hard field agro work are rather reduced. I am from Spain, cristian catolic, and own some land. I would really appreciate your opinion and given the wide spreading of Amish communities in América, where tó look. Thank you for your interesting chat. There aren’t any Amish in ND because it’s pretty remote from their population centers and they haven’t gotten there yet. There is a well-established Mennonite community near Devils Lake but they have huge farms and major water supply issues (their water usage is controlled by an international agreement with Canada), so there would be a problem making a go as small farmers. With the Amish as anyone else, basically it’s regulation that prevents common people from participating in revitalization of the economy. Now that President Trump is rolling back some of the whacko regulations that Obama put on the Western states, you’re probably going to see a lot of people moving in. I spoke with some North Dakota Mennonites, and they told me that there were Amish in ND 100 years ago, but the community folded. Everyone either became Mennonite or went back East. Looking at the data of the various states that the Amish live in, I see it is way out dated.